Ah, Wikipedia! Scourge and savior! I love Wikipedia and am quick to defend it against those who say it's uncertain or incomplete. Sure, I say, it may not be the best reference for controversial topics like George W. Bush, or the Arctic Refuge Drilling Controversy or Barry Manilow (Trust me, it's true), but what reason could there be to lie about mundane things like Sibbach v. Wilson or, say, Lincoln's sparrow? No reason that I can think of. Yet, there it was. While I was doing research for this post I clicked on the link (now changed, by me) for Thomas Lincoln, the man James Audubon named Lincoln's Sparrow after. The link brought me here. Lincoln's sparrow named after the future estranged father of Abraham Lincoln?! That's blogger gold! Fool's gold, however (I'm a great writer). Wikipedia led me astray. 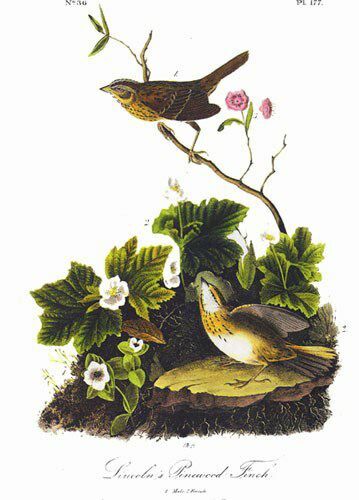 Further research - something every good journalist (and me) must always do - allowed me to discover that Audubon's friend who first shot the sparrow that would later bear his name was not Thomas Lincoln, father of Abraham, but Thomas Lincoln of Dennysville, Maine. According to page 109 of this book, Thomas Lincoln was born in 1812. Thomas came from successful stock, his grandfather being Benjamin Lincoln, a Revolutionary War general, a fatso, the recipient of the sword of surrender at Yorktown, and a friend of George Washington (I knew presidents would be involved somehow). Benjamin's fifth child, Theodore, was Dennysville's first settler, a Harvard graduate, a Judge, and Thomas' father. Coming from such a prestigious family, it's amazing to me that Thomas is most responsible for the Lincoln (of Dennysville) family name being remembered. While I couldn't find a whole lot about the man himself, what I could find painted a portrait of a man who wasn't quite as exciting as his relatives. According to this page, Thomas was "a successful farmer, taciturn neighbor and a staunch abolitionist." A taciturn neighbor! If, in a hundred years, the only thing people remember me for is being shy around the people who live nearby I'm going to spin in my cremated remains. Regardless of how infrequently he spoke to his neighbors, Thomas Lincoln will be always be remembered as the man the Lincoln's sparrow is named after. The story is short and sweet: Lincoln, a friend of Audubon's son, hopped aboard Audubon's 1833 trip to Labrador in search of new bird species. One day in June, Audubon heard a song he didn't recognize and challenged his crew to find its singer. Lincoln, being an excellent marksman, shot the little bugger and presented it to Audubon, who named it "Tom's Finch" (or "Lincoln's Pinewood-Finch" as it appears on Audubon's first sketch of the bird) on the spot. Audubon wrote that he named the bird for Lincoln because he was a favorite among the crew, and Thomas was given three cheers for the honor. Good times! So that's the story of Thomas Lincoln. Being a good Mainer, I wondered whether other "Lincoln" named things in Maine were named for Thomas or the Dennysville Lincolns. Turns out: No. The Town of Lincoln and Lincoln County were named for Enoch Lincoln, Maine's first governor. Also, Fort Gorges, that beautiful creaky deathtrap in Casco Bay, was engineered by a man named Thomas Lincoln Casey. Thanks for all your help, Wikipedia, I'll never say a bad thing about you again. By the way - your post has the trip in 1833 and the Wiki has it in 1834. Was this a multi-year expedition? Yup, multi-year trip. They left in 1833 and Lincoln shot the first sparrow in 1834.